People from away often think Portland Maine is our state capital, usually for one reason - it's the only city in Maine they've heard of! Let's face it, how many people can tell you that Augusta is actually the Maine state capital? 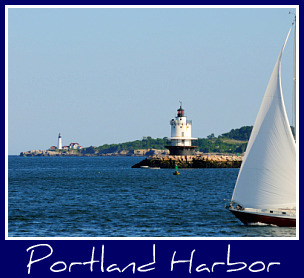 With a population of 64,000, the city of Portland Maine is our largest city, our big metropolis, and our dividing line between the majority of the population of Maine, who live in and around greater Portland and south to the New Hampshire border, and the great untamed woods to the north. And just think - this grand little city is an excellent day trip from York! On-street parking is relatively plentiful, and cheap compared to most other cities. The city of Portland even forgives one parking ticket every six months - something I have been very grateful for in the past. Besides on-street parking, there are several parking garages. Don't feel like driving? Take the Downeaster train from Wells, Maine! Flying into the city airport is easy, too, and it'll take you less than 10 minutes from the airport to be on the highway (Route 95)and heading to York. The video below includes references to the Portland Museum of Art, the Portland Children's Museum, the Old Port shopping district, and Portland's performing arts, all of which I've been to and heartily recommend! And though the video mentions continuing north 20 minutes to Freeport, you don't necessarily have to go up to Freeport to visit L.L. Bean. We like shopping at the L.L. Bean outlet at 542 Congress Street in Portland. Yowza (I love to give the Google translator words like "Yowza"!). Portland's restaurants are some of the best in the country. People are beginning to realize that Mainers like to eat really, really good food! And nowhere do we take food more seriously than in Portland. There's some great restaurant suggestions in the Bon Appetit article above, and from diners to high end dining, yer definitely eatin' good in the city on Casco Bay. And if you're having a difficult time deciding where to eat in Portland, Maine Foodie Tours can make life easy for you. But we also take our liquids seriously. Very seriously. As carefully crafted and meticulously prepared as the best dish in the best restaurant in the entire city of Portland, the city's brewery and distillery offerings are also making a name for themselves. Visiting any one of them will give you a excellent sampling of the best in beer and other spirits. A note about Maine Distilleries in Freeport, Maine: this is the only “ground-to-glass” distillery in the nation, where the company controls every aspect of production – from the planting of the potatoes to final bottling. I've tasted their classic potato vodka, Maine blueberry vodka and classic gin. All are world-class spirits. Portland! Go! See! Eat! Drink! Be Merry!